The John Hancock Tower under construction in 1971. Just days before construction was to begin in earnest on what would become the crown jewel of Boston’s skyline, the Hancock Tower’s architect hurried across the windswept and barren construction site. It was late summer 1968, and Henry N. Cobb’s father had died just days before. And now he was intercepted in Copley Square by an old family friend, a vestryman from the tower’s neighbor, the sandstone-and-granite masterpiece that is Henry Hobson Richardson’s Trinity Church. From designing Boston skyscrapers to revitalizing Somerville’s Assembly neighborhood, these people and projects are making a mark. Cobb’s crime was having the temerity to place a glass tower next to the magnificence of the Trinity Church. But the Brookline-raised, Harvard-educated architect knew something his critics did not. Its mirrored glass walls render his tower moot, deferring to and affirming the church as the square’s centerpiece. It is not hyperbole to say no one has had a greater imprint on the skyline of our city than Cobb, who is still designing buildings on 8½-by-11-inch paper that younger colleagues convert to whiz-bang computer graphics. Yes, at age 89, he’s still at it. Still engaged enough, excited enough to grab the notebook from my hand and sketch for me his vision for his latest addition to the high spine of skyscrapers that stretches from Boston’s downtown waterfront to the Prudential Center complex. 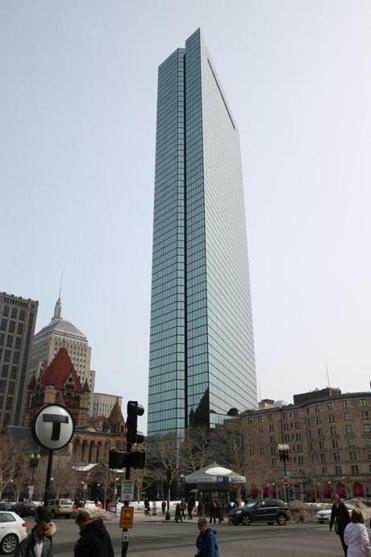 When finished, it will give him two of the city’s three tallest buildings, a 60-story tower of ritzy condos and what will be Boston’s most conspicuous residential structure, a $700 million project shaped like an equilateral triangle at 1 Dalton St.
“This will be kind of an exclamation point,” Cobb explained. Cobb has designed buildings across America and around the world. He has been at work on some skyscraper or another every day for the last 65 years. But ask him about his favorite work, and he’ll instantly transport you to the Seaport District and the red-brick courthouse where the Boston Marathon bomber received his death sentence last week. The design concept for the Hancock Tower fell into place during two frenetic weeks in the fall of 1967. The building next to Christian Science Plaza, in collaboration with Gary Johnson of Cambridge Seven Associates, came together almost as quickly. He labored over the Moakley federal courthouse for years. It is splendid. “The challenge here is to give you 27 courtrooms and 600,000 square feet of space without losing the dignity and identity of that one-room courthouse,” he said. And that is precisely what he delivered. There hasn’t been a whisper of discontent about the new residential tower that will rise next to Christian Science Plaza. There are no angry exchanges or expressions of outrage. He’s a visionary now, not a villain. Make it taller, they told him.